Innopipe removes the liquids which can be part of the cause of black powder formation. However, it’s clear that black powder is also present in suspended sub-micron size particle form in the gas phase Innopipe specifically avoids by design. Should you find your company battling particulate matter with conventional filters, cyclones etc. let us know and we can make recommendations of Innopipe compatible systems for the proven and highly effective magnetic filtration systems for the removal of ferrous as well as non-ferrous materials. 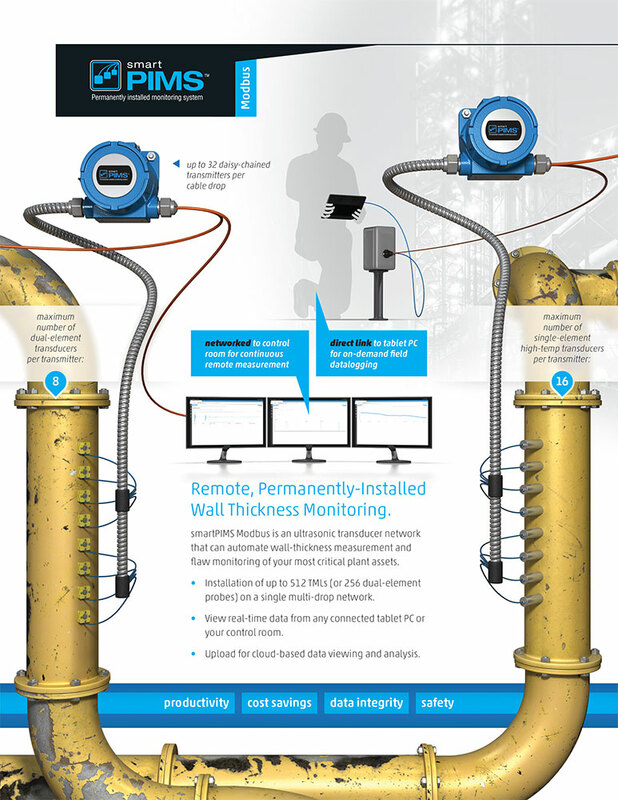 Monitor asset integrity using installed ultrasonic sensors from Sensor Networks, Inc. Although some users install Innopipe above ground or in bunkers, for Innopipe installations where the entire system is buried, it may be desirable to continuously monitor wall thickness. That is now possible with Sensor Networks’ PIMS (Permanently Installed Monitoring Systems). Installing Ultrasonic Thickness (UT) sensors for ID corrosion monitoring has significant advantages. Typical applications include continuous monitoring of buried equipment with reliable trending with precision and easy accessibility. Installed sensors can be used to optimize safety & asset integrity for inspection as well as monitoring for corrosion/erosion & cracks. Options include Smart PIMS Modbus installations. Innopipe units installed upstream of sonic measurement devices provide consistent, liquids-free gas flow for accurate metering. For natural gas processes requiring bi-directional measurement for custody transfer with minimal or no pressure drop, ultrasonic measurement devices offer better performance, reliability, and lower cost than mechanical-type meters. These meters do not have moving parts and pressure drop is much reduced with an ultrasonic meter compared to Positive Displacement (PD) and Differential Pressure (DP) meter. Common manufacturers are Emerson Daniel, FMC, Instromet, Krohne, Endress + Hauser and many others. 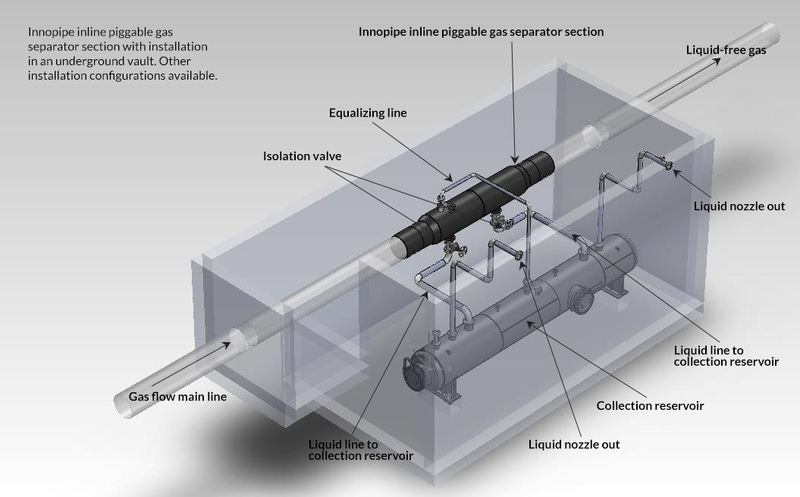 Configurations include clamp-on and inline designs, and make use of either Doppler or Transit Time techniques, as is explained here by Greyline Instruments Inc. in their article “Two technologies for Flow Measurement from Outside a Pipe“. 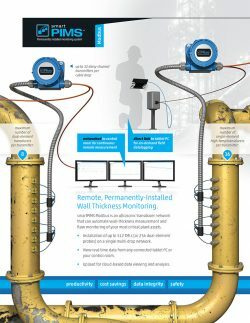 “How Ultrasonic Flowmeters Measure Natural Gas More Efficiently” in Flow Control Newsletter at www.flowcontrolnetwork.com. “The Ultrasonic Flow Measuring Principle” by Endress + Hauser. “Principles of Operation for Ultrasonic Gas Flow Meters” by John Lansing of Daniel Measurement and Control, Inc.
“Fundamentals of Ultrasonic Flow Measurement for Industrial Applications” Krohne Messtechnik GmbH & Co.